TRIVIA of Noh : Q83 : What is waki-dome? | Home | Trivia | Q83 : What is waki-dome? 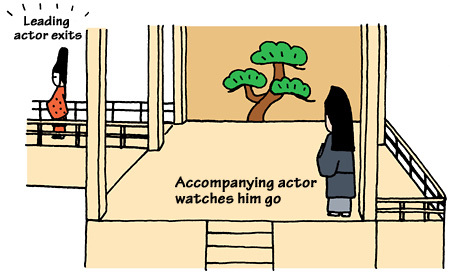 A Noh play often ends with the sound of the footsteps of the leading actor stepping twice at the upper stage right or on the bridgeway accompanied by the music. The ending sequence of the steps is called "tome-byōshi" (ending cadence). When everything is completed and all is silent in the theatre, the leading actor exits to the curtain, followed by the other performers. From the scene, you feel a special resonance unique to Noh plays. On the other hand, more than ten pieces including "Matsukaze" end with steps by the supporting actors, rather than by the leading actors. At the end of such pieces, the leading actor exits and the supporting actors left behind on stage step to complete the play. This type of ending cadence is called "waki-dome" (ending by supporting actors) and creates a resonance different in kind from an ending by the leading actor. The scene in which the leading actor disappears from the supporting actor's view leaves a strong impression on the audience. There are also some pieces that are completed by the steps of the accompanying actor. According to the method used, the departing actors and the space left behind create different types of resonance at the end of Noh plays.